Refinish your floors WITHOUT the dust! Do I need to leave the house while the floors are being refinished? How long does it take to make my floor look new again? What is the procedure for refinishing floors? What is the procedure to re-coat a floor? What should I do when my floors start looking dull? Are all floor finishes the same? What do I need to do before my floors are refinished? I want to pull up my carpets and have the floors refinished. Is there anything I should know before I start? How bad will the smell and fumes be? When is it safe to move furniture back in? It is not necessary for most people to leave their homes while the floors are being refinished. You will not notice dust. At times the sanding operation can be noisy. NOTE: We will work around YOUR schedule and can also perform the work in stages, a room at a time if necessary... and even return on a different day to finish the work if you have any scheduling conflicts. Totally flexible for your convenience. From one day to a week. It all depends on the size of floor you have and the job that is required. The floor is sanded with coarse paper to level a new floor or remove old finish. Then, the entire floor area is filled to eliminate cracks and nail holes. The floor is sanded two more times with progressively finer grit sand paper. Then screened with a high grit then 1 sealer coat is applied then screened again with an even higher grit then finally 2 coats of finish are applied to the floor. When considering whether a re-coating will suffice, or if a full refinish is required, it's helpful to try a water drop test to a high traffic area of the floor. If water drops bead instantly on the floor, then the finish is largely intact and a screening will probably do the job. If, on the other hand, the water soaks in quickly, then the finish has been sufficiently worn to expose bare wood fibers and a full refinish is probably required. The floor is cleaned with chemicals and screened, then 2 coats of finish is applied. A screen and re-coating of a wood floor (also known as a buff and coat) is a cost-effective way of refurbishing and revitalizing floors that have dulled over the years. Suitable for floors that are in relatively good condition, this procedure is performed by use of a buffing machine with an attached sanding screen that can remove minor surface scratches and marks. A complete refinish of a wood floor is usually called for when the finish is badly worn, and more severe scratches, dents and dings are visible. In this case, the floor is sanded down to bare wood to smooth out the blemishes, and two or three new coats of finish are applied. Start by giving it a good cleaning. If the result is not satisfactory, it may be time to have your floor screened and re-coated. No. Just like most other products, there is a great deal of difference between finishes. There are several that produce good results, but contain very large amounts of toxic chemicals. There are very few manufacturers that seem to have made a genuine effort to be health conscious, environmentally responsible, and produce a durable, high quality product. All furniture, carpeting, drapes, wall hangings, and kick-knacks should be removed. All nails or staples from carpet removal, must be pulled from the floor. Flooring machines create noise and vibration and could cause items to rattle & fall. Pets should be moved to somewhere out of the way where they will be happy. Also all the furniture has to be moved to another area of the house. For your safety, wear a dust mask. You are likely to stir up lots of stuff that you don't want to breathe. Take care to remove all staples, and to avoid damaging the floor. Some stains may be visible after the carpet has been removed. Black, or gray stains are usually caused by water, or pets. They often go deep into the wood, and may not completely come out. 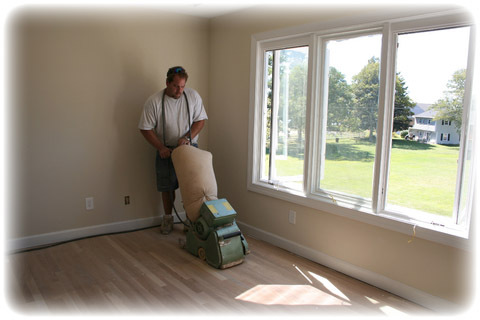 Dustless sanding uses a process with suction that provides a healthy, clean, efficient and revolutionary alternative for home and property owners. Traditional hardwood floor sanding produces enormous amounts of airborne dust, which is not only extremely messy and difficult to clean up, but can be toxic and carcinogenic, depending on the species of wood. This dust can linger in your air ducts, on walls and the ceiling, long after the sanding process has taken place, compromising the air quality of your home or place of business. Our dustless system will reduce or even eliminate the task of cleaning up enormous amounts of dust. If you are getting your floor stained then there will be a little bit of smell but no worse than the smell of paint. Depending on humidity conditions, usually the next day would be fine and area rugs will have to wait one week (7 days). "Call 770-317-2182 or click here for a FREE ESTIMATE and I'll get right back with you." Joe Iannelli's Hardwood Floor Refinishing & Installation - Contractor - Serving Marietta, Kennesaw, Cobb County, Atlanta, & surrounding areas.